For many years, I have been a Narnian buff, reading and rereading these wonderful medieval tales. Recently I attempted to schematize and diagram some of the military information found in the seven Chronicles of Narnia. This entry shows the order-of-battle for both sides at the Battle of Anvard, the main battle in The Horse and His Boy. The siege of Anvard was conceived by the Calormene Prince Rabadash, who planned to capture this strategically important city to facilitate an invasion of the northern countries of Narnia and Archenland. Rabadash and his two hundred cavalry ride across the desert, but the surprise they planned is thwarted by a young boy named Shasta. Shasta alerts King Lune of Archenland, who has time to barricade himself in Anvard and withstand a siege. Shasta and Chervy the stag then call upon King Edmund the Just of Narnia for a relief army to rescue the besieged King Lune. 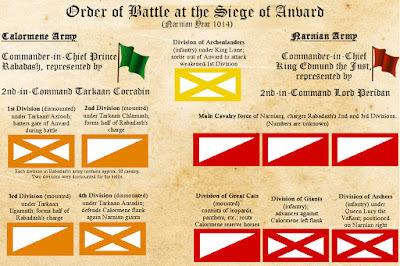 In a series of maps, I will chronicle the progress of the Siege of Anvard, but for now, here is the order of battle. Most of the details are taken from the book The Horse and His Boy, though necessarily there is some guesswork. 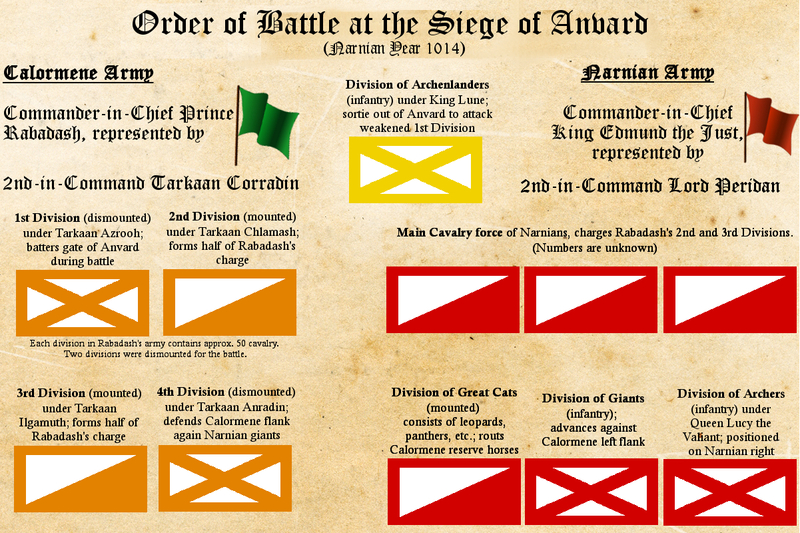 I have broken down the Rabadash's force into four divisions (I have called them divisions even though they could be known by another name), as the text indicated that this is the way in which the Calormene army is arranged. Each division of 50 cavalrymen is commanded by a Tarkaan (a great lord), with the fifth Tarkaan serving as Rabadash's 2nd-in-command. These Tarkaans are distributed in the order in which the Hermit of the Southern Marches names them. It seems to be a logical assumption that the Hermit would refer to them by decreasing seniority, i.e. 2nd-in-command first, commander of 1st Division, commander of 2nd Division, etc. The Narnian force likely outnumbers the Calormenes, though probably not by much. They are aided by a sortie from the castle of Anvard as soon as the Narnian Division of Great Cats neutralized the 1st Division of Calormenes. Stay tuned for a map of the battle of Anvard, with troop movements plotted and identified.